This weekend, we celebrate the example of a great man who lived among us, yet whose fire burned so greatly that he shook the powerful foundations of this country, and indeed the world. It's not lost upon me that today is Easter Sunday, and it marks the resurrection of the Christ figure in Christianity - Jesus Christ - after being killed by the State (i.e. the government and the society's powerful elite). Today, April 5th, also marks the day after the assassination of one of this nation's powerful and influential moral leaders and critics, Dr. Martin Luther King, Jr. I hope people see the parallels of this Easter Sunday to Dr. King's assassination, as his murder represented a similar sort of "check and balance" to the interests of the powerful and ruling leaders of American empire and racism during his lifetime. As we continue to remember and celebrate Dr. King's legacy, I encourage all of us to push against this notion of Dr. King as a passive dreamer, a person who gave speeches, and a person that turned the other cheek. I encourage all of us to understand and share Dr. King's message of direct action and resistance to all forms and instances of injustice, especially those rooted in racism, poverty and the inhumane treatment of other human beings. I encourage all of us to push against the sanitized urging of people toward community service when celebrating Dr. King, when absent a component of education and resistance against individual, institutional and other forms of racism. Service in and of itself is a great thing, yet doesn't automatically imply resistance against the great forms of injustice our nation and world continue to struggle with. 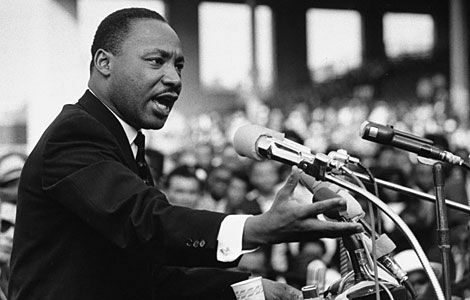 Below is one of the key speeches that illustrated Dr. King's true revolutionary vision of a nation that honors its founding principles, acknowledges its contradictions, attempts to repair the damage caused by its wrongdoings, and that seeks to help in developing a world free of violence and full of peace. This speech is Beyond Vietnam: A Time to Break Silence, and was delivered on April 4, 1967, at the Riverside Church in New York City. During the year following this speech, Dr. King's powerful influence became so much clearer, as he became public enemy number one in this country, even among those who once stood by his side. Dr. King was assassinated on that very same day, one year later - just after 6 p.m. on Thursday, April 4, 1968 in Memphis, Tennessee. There are key messages in here that we can all reflect on, and in fact bring life to, as we honor Dr. King's example and legacy. We cannot be silent! We must speak out against injustice whenever and wherever we find it. We must move beyond the popular notions of patriotism to a higher ground of principle. Injustices we see abroad are not disconnected from the injustices we see at home. The brutality of racism in the United States is inextricably connected to the brutal oppression of people who are poor throughout this country and the world. Oppression of any people reflects a crisis in the human spirit, a failure to recognize and affirm the human dignity of another human being. Resistance against racial violence, and violence against poor people, is the work of making America what it ultimately should become, and what it claimed to aspire to in its founding documents. America - and the world for that matter - will never reach its full potential until the descendants of enslaved Africans achieve full freedom, justice and human dignity. This work takes me beyond national allegiances, and is rooted in my relationship to Jesus Christ. My work resisting oppression is a part of my work of honoring my God. We must all speak out and on behalf of the voiceless, those whose lives we affirm yet who are not present to speak on their own behalf. I cannot speak out against the brutal injustice in one place and not acknowledge and speak out against other injustices staring right at us. We have to seek out opportunities for creative protest. We can choose methods of protest that match our personalities, but we must all protest. We have to put our lives on the line for the nation and world we envision, for us today and for the next generation. Our struggle is an international struggle in its essence. There must be a profound change in American life and policy. This call takes us beyond Vietnam, but not beyond our calling as Children of God. Democracy Now featured an interesting discussion with Ana DuVernay yesterday, talking about her most recent film, Selma, and the broader significance of the film given this nation's current undoing of key civil rights-related legal protections that were the hallmark of the civil rights movement. DuVernay offers a number of interesting insights about the current state of civil rights and race relations in this country, as well as the key influences that made this film project possible. She covers the process of making the film, the non-controversy about her depiction of LBJ and the continuing struggle for justice for the millions of Black women, men and children throughout this country. Watch the four key segments of the discussion just below. Tuesday, January 27, 2015 -- Today we spend the hour with Ava DuVernay, the director of the acclaimed new civil rights film "Selma," which tells the story of the campaign led by Dr. Martin Luther King Jr. to draw the nation’s attention to the struggle for equal voting rights by marching from Selma to Montgomery, Alabama, in March of 1965. Below is the audio of one of Dr. King's most impactful public speeches. Many people say that this address, challenging the war in Vietnam, was the singular address that sealed his fate. This address, more than any of his others, linked the struggle for civil and human rights among Black folks in this country, with the contradictions and anti-democratic principles inherent in the broader domestic and foreign policy of the U.S. government. If and when you are able, I highly recommend reading the text without the audio, or at least reading along with the audio. I also recommend taking a few minutes in between paragraphs, or specific sections of the address, and really contemplating the significance and meaning in each statement. I've spent lots of time over the years listening to Dr. King's speeches, and admittedly less time actually reading the text of the same speeches. After reading more and more of the text, however, I've come to appreciate that there is so much more richness, and so much more meaning, in the address than the listening experience may reveal. 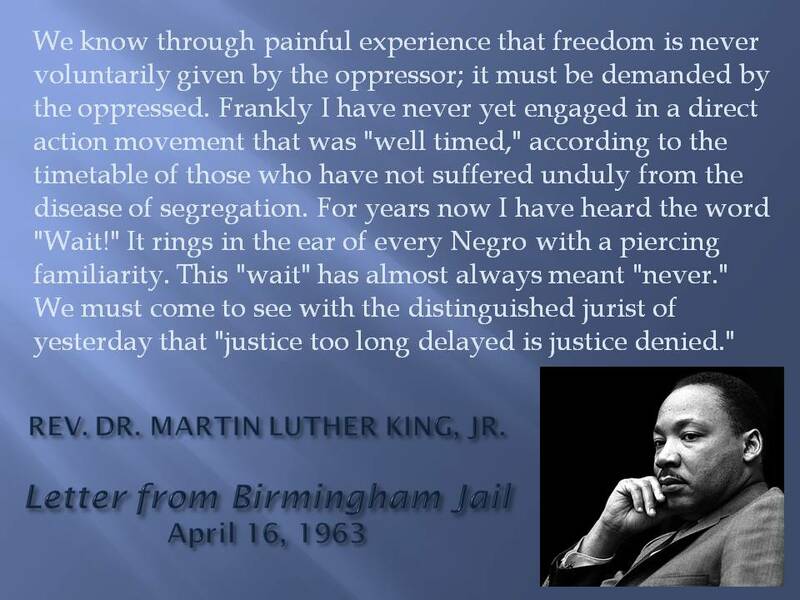 Dr. King remains one of the greatest teachers and theologians we've produced in our history in this country. If more of us displayed an ounce of the courage as Dr. King did, and even a fraction of the intellectual discipline required to develop and advance an agenda that guarantees the well-being of our people, we would not be confronted with the same problems today as we have been for multiple generations. We have lots of work to do. We can solve the problems in our community. But our focus has to extend beyond the King holiday season, or any of these other nostalgic reflections on the glories of the civil rights movement. While we must absolutely rally around the causes that impact our daily life experiences in this country, we must always be mindful of how this/our current struggle exists as a part of the broader thread of African and African American liberation movements throughout history, and how this struggle connects to the human rights struggles of all of the world's people who want nothing more than peace and well-being for their children, families and future generations. We deserve well-being for our people, and our love and appreciation for our ancestors and future generations demands that we continue the struggle. Let us reclaim and call upon the real courage it takes to push forward, with the well-being of African people, in this country and abroad, front and center in our efforts. Celebrating the 86th Birthday of Rev. Dr. Martin Luther King, Jr. Yesterday the world learned of the passing of Dr. Vincent Harding, a leading and influential figure during the Civil Rights movement, and a lifelong historian and professor or religion. He was 82 years old. The following is a very brief excerpt of a fuller bio, followed by a 10-minute excerpt from a thoughtful and insightful discussion with Dr. Harding that appeared on Religion and Ethics Newsweekly just before last year's 50th anniversary of the March on Washington. Dr. Harding's life and work will continue to be remembered. Today is the federal holiday that honors Dr. Martin Luther King Jr. He was born January 15th, 1929. He was assassinated April 4, 1968, at the Lorraine Motel in Memphis, Tennessee. He was just 39 years old. While Dr. King is primarily remembered as a civil rights leader, he also championed the cause of the poor and organized the Poor People’s Campaign to address issues of economic justice. Dr. King was also a fierce critic of U.S. foreign policy and the Vietnam War. We play his "Beyond Vietnam" speech, which he delivered at New York City’s Riverside Church on April 4, 1967, as well as his last speech, "I Have Been to the Mountain Top," that he gave on April 3, 1968, the night before he was assassinated. Randall Robinson – Duke University’s 2011 Celebration Honoring Dr. Martin Luther King, Jr.
Randall Robinson - "Connect to the Dream: Facing the Challenge of a New Age"
Randall Robinson begins with a critically important analysis of the African American experience of disconnection and dislocation from our African history and identity. He goes on to argue for our collective and continuing responsibility/obligation to reconcile this history with America's contemporary "place" in the world, and the continuing injustices inflicted upon African American families and communities today. If this nation wants to be relevant in the future, we must continue to acknowledge the hard and painful truths about this nation's history and present, and work tirelessly to transform this pathological reality of racism and oppression. Each of us must follow our path in service of this goal, and share what we can as future generations take their turn. Introduction by Ms. Nana Asante begins at approximately 53 minutes. Address by Randall Robinson begins at 56:45 (approximately). From April 5, 2013, on Moyers and Company. View site for full transcript. Martin Luther King, Jr., who died 45 years ago this month, had long known that racial equality was inextricably linked to economic equity — fairness for all, including working people and the poor. In the last year of his life, Dr. King announced the Poor People’s Campaign to demand an “Economic Bill of Rights” for all Americans, regardless of color. But nearly a half-century later, that dream is still a dream deferred. Pulitzer Prize-winning historian Taylor Branch and author and theologian James Cone join Bill to discuss Dr. King’s vision of economic justice, and why so little has changed for America’s most oppressed. Also on the show, poet Kyle Dargan talks about his efforts to reconcile disparate cultural environments through poetry.